Personalized care is always better — especially when it comes to your smile transformation. These days, it’s an unfortunate fact that too many dentists are focused on selling a service rather than really considering what’s right for each patient. Far too often, that means performing drastic treatments that remove much of the natural, healthy tooth structure. But that doesn’t mean that cosmetic dentistry is something to stay away from. You can still enjoy a transformative smile experience — it just requires a little research and time spent looking for the right cosmetic dentist in Littleton. At Blue Sage Dental, Dr. Kutis provides personalized cosmetic dentistry with your best interest in mind. It’s here that our patients become part of our family, and that means Dr. Kutis will always consider what’s best for you and your smile. Whether it’s a quick but powerful professional teeth whitening treatment, beautiful, natural-looking porcelain veneers, or one of our other popular cosmetic treatments, you’ll find just what you need at Blue Sage Dental — and none of what you don’t. And what is conservative dentistry? It’s a tenant of Dr. Kutis’s philosophy: providing effective, conservative care for each and every patient. 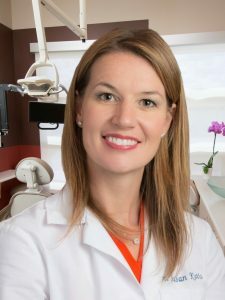 She puts together unique treatment plans focused on keeping as much of the natural tooth structure intact as possible. What’s Possible With Cosmetic Dentistry? One size does not fit all when it comes to your smile. If you are interested in learning about your options in cosmetic dentistry, schedule a consultation with Dr. Kutis. Then the two of you can sit down and discuss your smile — including how it got into its current state, and what you’d like to achieve with cosmetic dentistry. She’ll consider your teeth, facial structure, your lifestyle, and your smile goals to put together a treatment plan that’s suited just for you. Professional teeth whitening is one of the most popular aesthetic treatments. It is a good option for people who would like to refresh or rejuvenate the appearance of their teeth without investing a lot of time or money. In-office whitening brightens smiles up to eight shades in just one, one hour treatment. Patients who are interested in a more transformative treatment may be better suited for porcelain veneers. Thin wafers of dental porcelain, veneers are securely affixed to the front side of the teeth that show when you smile. Dental veneers restore or enhance the appearance of chipped, stained, misshapen, or otherwise cosmetically flawed front teeth. A more conservative option in cosmetic dentistry is cosmetic bonding. Using biocompatible, natural-looking composite resin, Dr. Kutis can rebuild and sculpt a brand new tooth. Cosmetic bonding does not alter the original tooth structure, so no anesthesia is required. The procedure can usually be performed in just one visit to the dentist’s office. Whichever cosmetic treatment you could benefit from most, know that Dr. Kutis’s recommendation comes with your best interest in mind. For personalized, conservative cosmetic dentistry, turn to Blue Sage Dental. Schedule a consultation to discuss what’s possible with your smile today!